Using parachuting bears to catch Bin Laden is just one great idea submitted to the US Department of Defence in recent years. Bears have scent detection that is far superior to bloodhounds! Trained bears with GPS and day/night cameras around their necks might be able to hunt down the scent of [Osama bin Laden], even in and through any caves and tunnels!!! Overnight, parachute some bears into areas [bin Laden] might be. 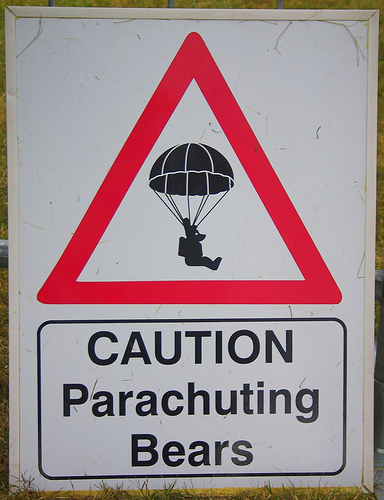 Attempt to train bears to take off parachutes after landing, or use parachutes that self-destruct after landing. “The authors’ names were withheld, but all spelling, grammar and paranoia are authentic,” notes Stars and Stripes.